Now entering its 5th season, Dulles Duals is one of the most popular youth wrestling events in the Washington area. The program attracts teams from Virginia and Maryland and now consists of four divisions so wrestlers of all ages and experience levels can enjoy these unique events. All events are held at Top of the Podium Wrestling Center. Our goal is simple: To provide a unique atmosphere for teams who want quality matches for their wrestlers and the opportunity to build team spirit. The traditional dual meets feature team introductions, smoke machines/flashing lights, loud music, videos, full circled mats, and more. For obvious reasons, these events are often the highlight of the season for many kids (and their families). Teams that fully participate in the following divisions automatically qualify for the TOP Championships held in February. Rising Stars. This division is intended for intermediate-to-advanced wrestlers from 2-6 grade (see restrictions below*). The 12 weight classes range from 50-100 pounds with age restrictions placed on some of the lighter weights. This winter, regular season meets are planned for two Saturdays (December 15 and January 19). At each event, a team wrestles 2-3 dual meets against other clubs. 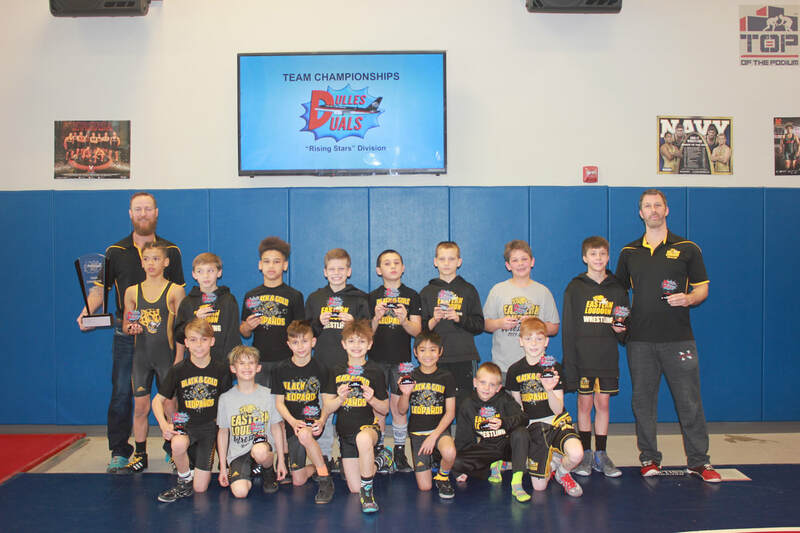 Teams are expected to bring competitive lineups, and regular season results will impact seeding at the annual Elementary Team Duals Championship on March 2. The winning team has a banner hung at TOP and gets the team name inscribed on the official trophy. Individual trophies are also awarded to wrestlers and coaches on the winning team. Fees for this division (which typically includes 8-9 duals) are $795. Novice. This division is intended for “rookie” and less experienced wrestlers in grades K-5. A team’s primary goal isn’t to win the dual meet but rather obtain quality, exciting matches for the participants. To this end, coaches often coordinate in advance in match up comparable opponents. While there are 12 weight classes, coaches have more flexibility in arranging matches. This winter, all novice duals will be conducted on February 16. We expect each team to wrestle in 3 duals against other clubs on this date. Fees for this division are $299. Middle School Clubs. Congrats to the 2019 Champions--the NOVA HAMMERS who were crowned on January 19. This is a competitive division for club teams comprised of 6-8 graders (5th graders are eligible if they choose to wrestle up). The 12 weight classes range from 75-199 pounds. Each team wrestled four dual meets this year. Fees for this division were $299. Middle School Teams. This is a competitive division, but wrestlers must attend the school they represent. We will allow two middle schools to combine to form a legitimate team (and also allow two exceptions, i.e., wrestlers can attend a private or different school). Wrestlers cannot participate in this division and the “Middle School Club” division without prior permission. There will not be a championship dual tournament at the conclusion of the season for this division, thus coaches are granted flexibility in arranging matchups if they so choose. These events will take place on two Friday nights (January 18 and February 15), and teams should expect a total of 4-6 meets for the season. Fees for this division are $475. If you represent a club/team that is interested in participating in Dulles Duals during the 2018-2019 season, please contact Tom Houck at Top of the Podium.